Urban flooding is a multibillion-dollar challenge for Canadians. (For more information, see the article, “Urban Flooding in Ontario: Toward Collective Impact Solutions,” published by RAIN Community Solutions in 2017.) Since the 1970s, approximately half of all natural disasters in the country have been caused by floods. (This statistic is derived from the 2016 publication, “The Road to Flood Resilience in Canada,” from Swiss Re.) In urban centres, pluvial flooding (i.e. caused by torrential rainfall) can be particularly destructive. The situation has been exacerbated by an increased area of hard surfaces as a result of urbanization, outdated and undersized stormwater infrastructure, and increased extreme weather associated with climate change. In recent years, municipalities across North America have increasingly invested in green infrastructure to help mitigate the instances and severity of flooding. Both New York City and Philadelphia are implementing green infrastructure into city-owned property to reduce combined sewer overflow (CSOs), enhance city resiliency, and improve flood management. green technologies such as pervious pavements, infiltration trenches, or rainwater harvesting. Aerial photo of Green Roof Innovation Testing Laboratory (GRIT Lab) test modules. Over the past decade, the construction of vegetated roof systems (i.e. 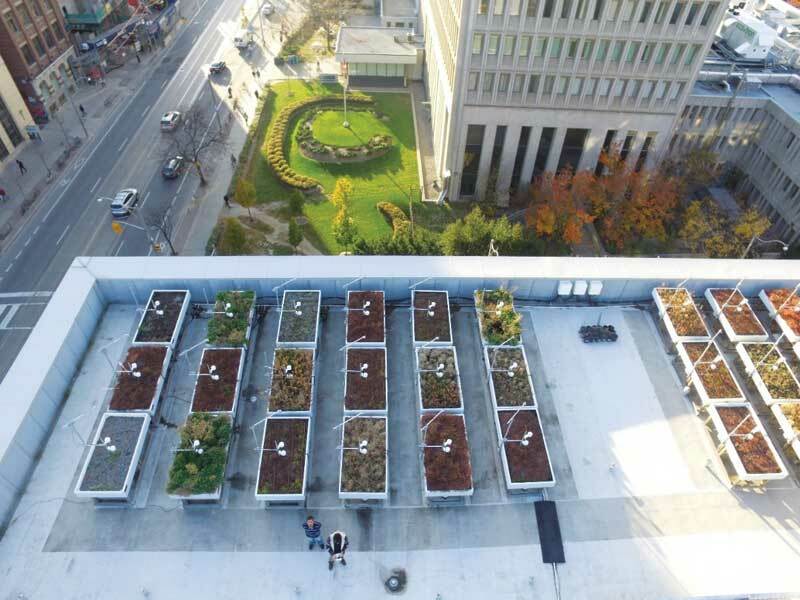 green roofs) has rapidly increased across Ontario. 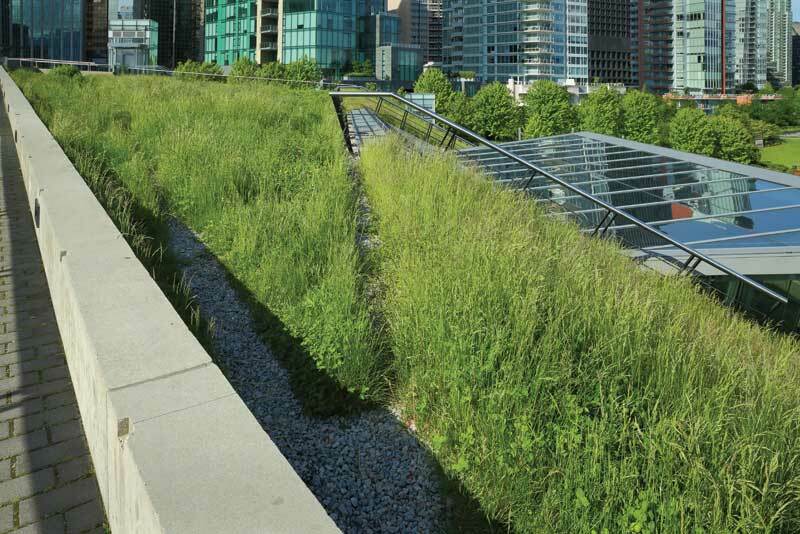 With the implementation of the Green Roof Bylaw in 2008, Toronto has quickly become a hotspot for the green roof industry in North America. The bylaw applies to all new building permits for residential, commercial, institutional, and industrial developments with a minimum gross floor area of 2000 m2 (21,528 sf). Its required coverage for a green roof ranges from 20 to 60 per cent of the gross floor area, increasing with a building’s footprint. Thus, it is no surprise Toronto has the second-largest total amount of green roofs installed in North America, with more than 55,742 m2 (600,000 sf). (This information comes from Green Roofs for Healthy Cities’ [GRHC’s] “2016 Annual Green Roof Industry Survey Executive Summary.”) In high-density urban centres, these vegetated assemblies are an effective technology for mitigating urban heat island effects (for more information, see J.S. MacIvor, L. Margolis, M. Perotto, and J.A.P. Drake’s “Air Temperature Cooling by Extensive Green Roofs in Toronto, Canada” in volume 95 of Ecological Engineering, E. Del Barrio’s “Analysis of the Green Roofs Cooling Potential in Buildings” in volume 27 of Energy Build, and B. Raji’s “The Impact of Greening Systems on Building Energy Performance: A Literature Review” in volume 45 of Renewable and Sustainable Energy Reviews) and managing stormwater, (more information can be found in K.X. Soulis, N. Ntoulas, P.A. Nektarios, and G. Kargas’ “Runoff Reduction from Extensive Green Roofs Having Different Substrate Depth and Plant Cover,” in volume 102 of Ecological Engineering, V. Stovin’s “The Potential of Green Roofs to Manage Urban Stormwater” in volume 24 of Water Environment, and J. Hill, J. Drake, and B. Sleep’s “Comparisons of Extensive Green Roof Media in Southern Ontario,” in volume 94 of Ecological Engineering) while simultaneously creating multifunctional spaces with the opportunity for public green space. A green roof can be any system that supports rooftop plantings. They range from intensive green roofs large enough to support mature trees to rooftop gardens supporting urban agriculture. Intensive green roofs, capable of supporting large vegetation, are best suited to new construction and publically accessible roof spaces. Across Canada, extensive green roofs are a popular system because they are lightweight, shallow, and cost-effective. As light and low-maintenance systems, extensive green roofs are easily integrated into both redevelopment projects and new construction. However, even within this category, there is a great range of variability, as roofs are designed with different combinations of plants, substrate, and irrigation.